Bathroom renovations in Winnipeg along with the rest of Canada are leading the category of all home renovations currently taking place in existing single family dwellings. The form, function and pleasure that you will receive from a new properly planned bathroom renovation in Winnipeg will yield you returns both now and in the future. 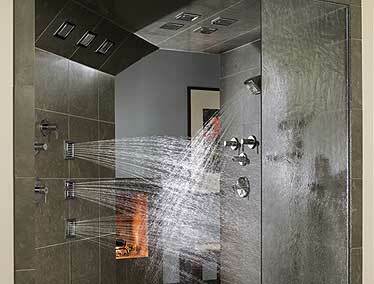 Today’s designer tips emphasize choosing a feature for your bathroom. Choose which design item you want to feature in the bathroom and then work the rest of the bathroom design around it. A beautifully curved handbowl set into a minimalist vanity unit with a mirror as a backdrop, a sensuously curved bath placed in the middle of the room, a walk in shower with vibrant tiling or a sunken bath surrounded by quality tiling can all be used as features. Consider building an open-concept shower area that doesn’t need a curtain or door and is less confining than a standard shower stall. A ceiling-mounted rain showerhead and/or a high wall-mounted showerhead that splashes less water will keep the area outside the shower drier.